With his parents divorcing and forced to leave his private school life and girlfriend, 15 year old Spencer Rogers enters a rough period in life while suffering at the hands, of Rayshaun Washington and Xavier Rodriguez. Spencer is forced to give money to Rayshaun and Xavier on a daily basis. The pressure leads him down a road of no return.Award winning film maker Darrell Smith confronts the worldwide epidemic of bullying. 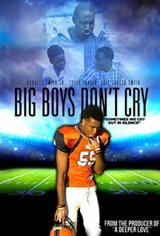 "Big Boys Don't Cry is a powerful and touching anti bullying film, not only does it take you into the life of kids being bullied, it also takes you into the life and family of the bully. Maybe next time, the world will think twice before telling a child....Big Boys Don't Cry.